Keith Andrew Meeks, age 44, of Lawrenceburg, TN passed away Wednesday, December 19, 2018 at Allenbrooke Nursing and Rehabilitation Center in Memphis, TN. He was a native of Lawrence County, TN and a former security guard. 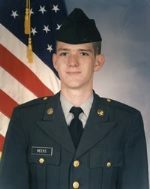 He served his country honorably in the Army National Guard in Kuwait. He was preceded in death by his mother, Retha Camron Meeks. Arrangements are being handled by Neal Funeral Home, 231 N. Military Avenue, Lawrenceburg, Tennessee. A memorial graveside service will be held at a later date.